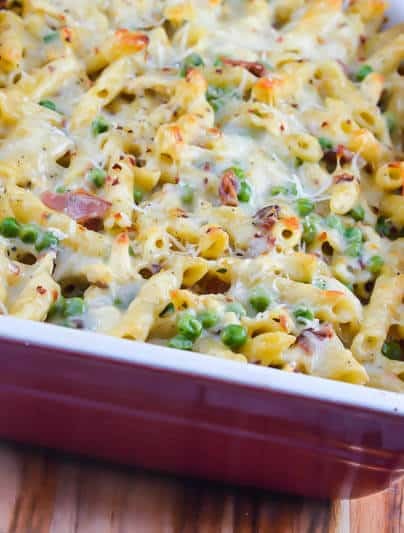 Cheesy Chicken Bacon Ranch Pasta combines lots of my favorite flavors, such as bacon and ranch, into a creamy, cheesy, comforting chicken and pasta baked casserole. 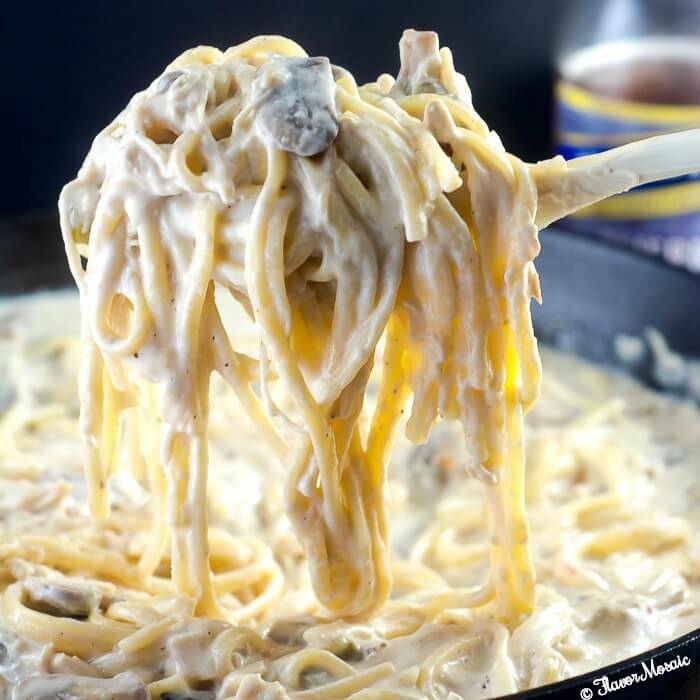 This Cheesy Chicken Bacon Ranch Pasta is a budget-friendly, family-friendly, and delicious recipe. It is also an excellent way to use leftover chicken and leftover bacon (Is there ever any leftover bacon? ), and feed a crowd. 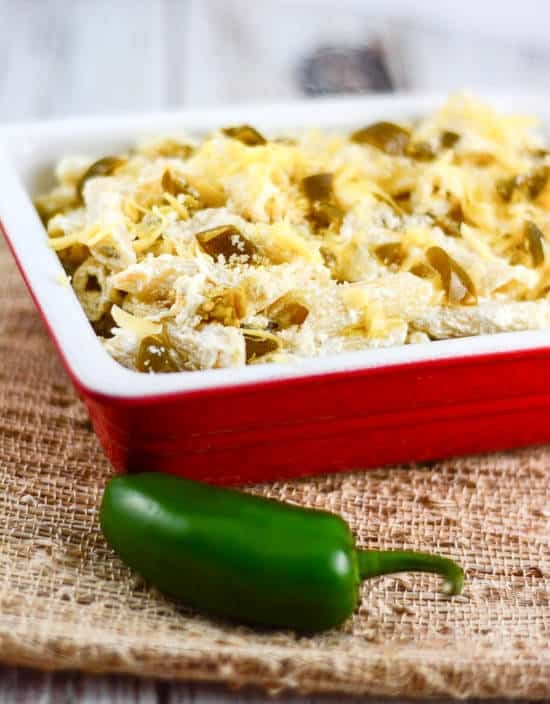 It is one of our favorite family dishes, along with other chicken casseroles like King Ranch Chicken Casserole, Chicken Broccoli Cheese Quinoa Casserole, and my Easy Chicken Pot Pie Casserole. What’s not to love? It has all of our favorite flavors including bacon and ranch and chicken all combined with cheesy pasta! Gotta have the cheese! Serve it with a salad and breadsticks and you have a complete meal. Almost a complete meal….unless you want to add a glass of wine with that. You can’t go wrong with this pasta. It is always a crowd-pleaser because well because, first of all, it is pasta! People love pasta, especially if it has cheese and bacon. When I told my husband I had fixed a chicken and pasta casserole, he was a little hesitant, that is until he saw it and tasted it. Then he said it tasted fantastic and asked me to make it again. I used penne pasta, but you could use any pasta you have in your pantry. Take this to your next party, get together, or potluck and you will be the hit of the party. Or just make it for your next weeknight supper or Sunday supper for your family and they will love it. Be sure to try and swing back by to leave a comment to let me know how you liked it! 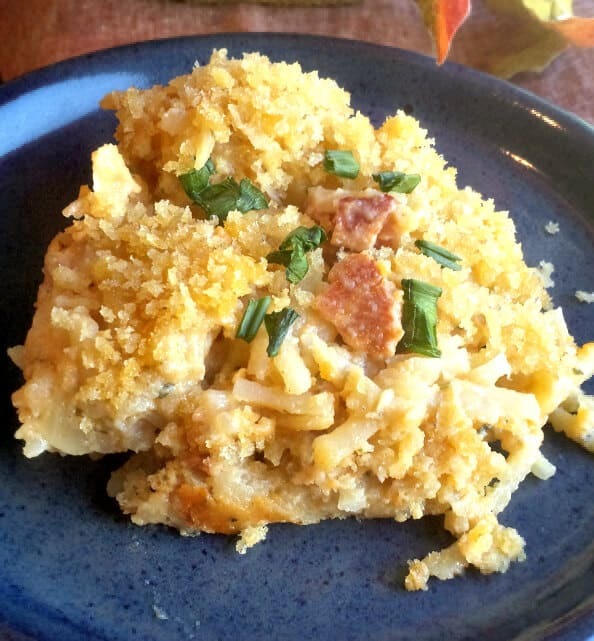 If you like this, check out my Cheesy Bacon Ranch Hash Brown Casserole too! Thanks for visiting Flavor Mosaic! If you like this recipe, subscribe via email and have them delivered directly to your inbox. Don’t forget to stay in touch by following Flavor Mosaic on Pinterest, Facebook, and Twitter. 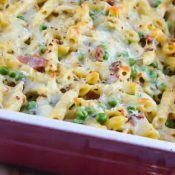 Cheesy Chicken Bacon Ranch Pasta combines chicken, bacon, and ranch, into a creamy, cheesy, comforting chicken and pasta baked casserole. Preheat oven to 350 degrees F. Spray 9x13 baking dish with cooking spray. Prepare pasta according to package directions. Rinse and drain. Set aside. In a large saucepan over low heat, melt butter. Add minced garlic and crushed red pepper, if desired. Add the flour and stir in with the butter. Add the heavy cream and chicken broth and continue stirring until thickened. Stir in half a package of the ranch salad dressing and seasoning mix. Remove from heat and stir in parmesan cheese. Place pasta in bottom of 9x13 baking dish. Top with chicken, bacon, and peas. Pour sauce over the top. Sprinkle mozzarella cheese over the top. Bake in a preheated oven for 30 minutes or until heated through and cheese is melted. Shredded rotisserie chicken works well in this recipe. 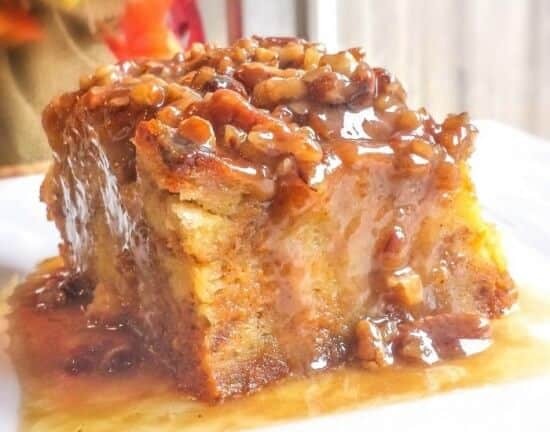 If you love this recipe, try my popular Pumpkin Praline Bread Pudding! If you like this recipe, you may also like Chicken Tetrazzini with Asiago Cream Sauce. 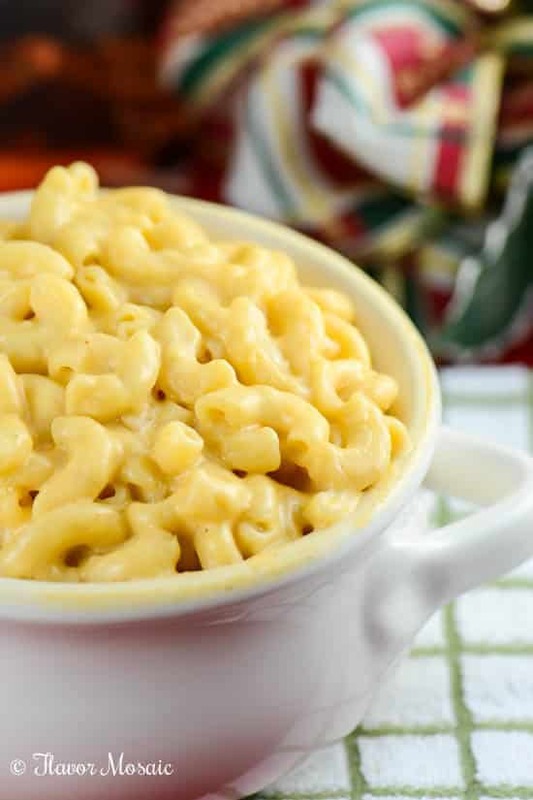 If you like this recipe, you love my Five-Cheese, Fifteen-Minute Mac ‘n’ Cheese. 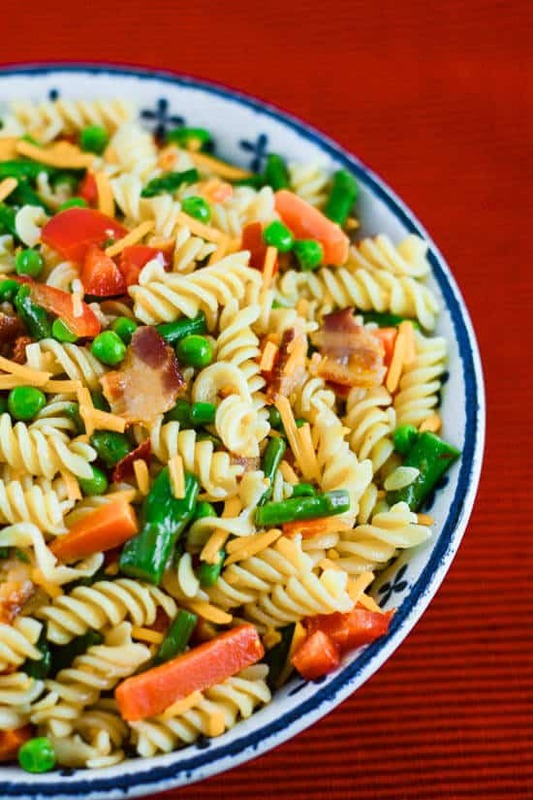 If you like this recipe, try my Bacon Pasta Salad Primavera recipe. Another pasta recipe you might like is my Jalapeno Popper Pasta Salad. 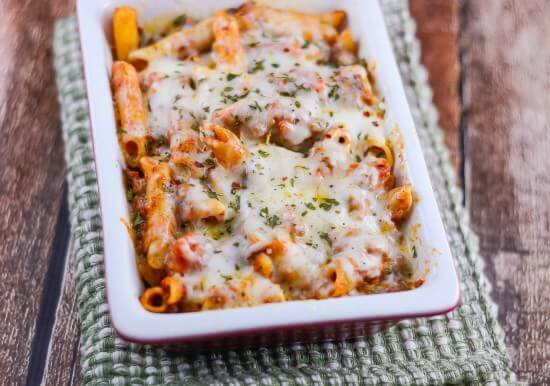 And who doesn’t love Baked Ziti. 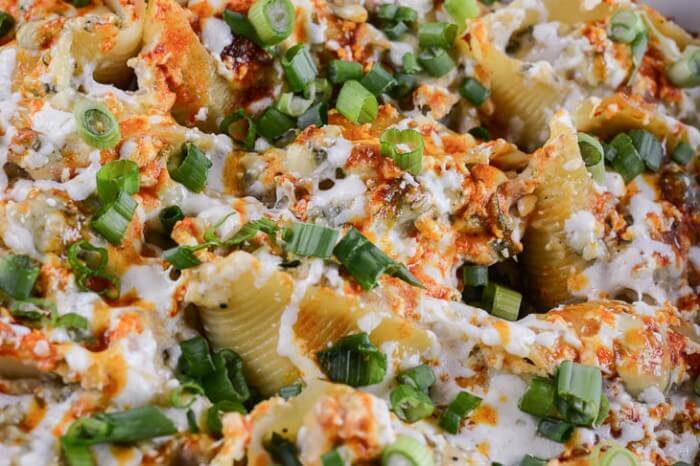 While you are here, don’t miss my Buffalo Chicken Stuffed Shells. This post may be included in one of these fantastic link parties and The Weekend Potluck #107. Hi Lauren. Thank you for visiting and pinning! at what point do you add the flour? Thank you for letting me know. I updated the instructions. Add the flour after the butter and garlic and crushed red pepper. thank you! honestly looks fantastic! You’re right, pasta + bacon and cheese is always a winner. This sounds incredible. Thanks for sharing on the weekend re-Treat Link Party! Hope to see you again tomorrow. Hi Britni. Thanks for visiting. I will try to post there again next week. Thank you for pointing that out. It was inadvertently left out. I updated the recipe to add w1/2 a packet of the Ranch salad dressing and seasoning mix. What would you recommend as a substitution for the peas. My family is not a fan. Also, only 1/2 pkg. of ranch??? Since I will be adding more meat (2 is not enough for our family of 4), do you think I could add a whole pkg.? I made this for dinner tonight and it turned out amazing. I was thinking of substituting broccoli florets instead of peas next time. I’m so glad you made it, and liked it. Broccoli go great in it. Thanks for letting me know. Just making this now. I also doubled the amount of chicken. I left the recipe as is, but wonder if I should have doubled the sauce recipe? I made this last night it was fantastic !!! When I told my husband what I was making he was less then enthused . But when he ate it he absolutely loved it he had 3 huge bowls ! I had to make two adjustments I used broccoli instead of pees and cheddar cheese for the topping but even with the few changes it was delicious thank you so much will be saving this recipe! Hi Michelle, thank you so much for making it. I’m so happy you and your boyfriend loved it! I totally believe in customizing recipes to your taste preferences and based on ingredients you have on hand. I bet this tasted fantastic with the broccoli and cheddar cheese on top. Thank you for sharing. How thick is the sauce supposed to be? It may start out thin but keep stirring and it should thicken up. Hi Michele! I wanted to thank you for this wonderful recipe. I’ve made it many times and is always a family pleaser. Thanks again for sharing! Hi Joanne, thank you so much for letting me know. You have no idea how happy that makes me. Please feel free to share my recipes with your friends on social media. Thank you so much for letting me know you liked it. That is great. I love this recipe. It is so versatile you can customize it to your taste. Hi! I was wondering if you use rotisserie chicken about how much would you use? Thanks! Hi Amber, yes, you keep the heat on low. It takes a little time to thicken. I added the Ranch after it thickened. Can you substitute ranch dressing instead of the ranch seasoning packet? Hi Victoria, the ranch seasoning packet is a dry seasoning mix vs an already mixed up dressing. It is also a more concentrated flavor. I have not tried making the substitution. If you were to try this, I would recommend reducing the amount of heavy cream by the amount of the ranch dressing you add. Since I have not tried this, substitution I can’t guarantee results.